Just released on CD, A Spoonful of Sherman is a delightful recording that preserves one of the most sparkling revues of recent years. Staged at the St James Theatre in 2014, the show captured the songwriting genius of Richard and Robert Sherman. I reviewed it then (here) and an extract of my review, now to be found quoted on Wikipedia reads “It is a wonder that this charming show has not been staged before. Amidst all of Broadway’s giant songwriting partnerships, none reaches out to the child within us quite like the legacy of the Sherman Brothers. Cleverly crafted songs that speak of hope against adversity, written in verses that talk to every age.” Listening to the CD now, those words ring ever true. The two disc compilation not only includes the show’s music, but also Robert Sherman’s son Robbie’s commentary that affords a remarkable insight into the lives of his father, uncle and grandfather. Aside from Disney classics that included The Jungle Book and Mary Poppins, the Sherman brothers penned soundtracks for other studios’ movies such as Chitty Chitty Bang Bang and The Slipper And The Rose. Few other movie scoring partnerships have matched their prodigious output. Robbie Sherman conceived the show with musical director Colin Billing – and it is Billing who accompanies on piano throughout – assembling a lineup of some of the UKs finest musical theatre performers. Leading ladies Emma Williams and Charlotte Wakefield sing with Stuart Matthew Price and Greg Castiglioni, with solos and close harmonies that make an exquisite collection. As expected there are lavish nods to the Shermans' most famous works. Williams’ Feed The Birds and her later duet with Price in Doll On A Music Box / Truly Scrumptious capturing the magic of the originals and imbuing them with a contemporary poignancy. The CD brims with moments of wistful reflection for those of us old enough to have had these songs as the soundtrack to our childhood. Castiglioni contributes a noble Bert from Mary Poppins with Step In Time, whilst his Ugly Bug Ball is a comic treat. Mention too to Price’s Poppins number – A Man Has Dreams – another gem. Wakefield leaves her mark of youthful excellence on the show’s title number, whilst also reminding us of quite what a gem The Jungle Book’s My Own Home truly was. Not just about the big movie numbers, there is a nod to the Sherman Brothers’ oft forgotten contribution to Tin Pan Alley that includes Price’s take on the 60’s classic You’re Sixteen along with Tall Paul. Robbie Sherman has inhertited the family’s musical genes and the album also includes a couple of numbers from his own work Bumblescratch – but it is in his appreciative commentaries on his forebears that so much is revealed. Robert Sherman was amongst the US troops that liberated Dachau and thus bore witness to the depths of man’s inhumanity. In the post-war years and as the Cold War prevailed, this knowledge gives an added depth to the purest sense of human optimism that underscores the brothers’ There’s A Great Big Beautifiul Tomorrow and the timeless (and to be fair, often infuriating!) simplicity of It’s A Small World (After All). Offering so much more than just a collection of beautifully performed songs, this is a lovingly crafted tribute to a pair of the 20th century’s cultural giants. 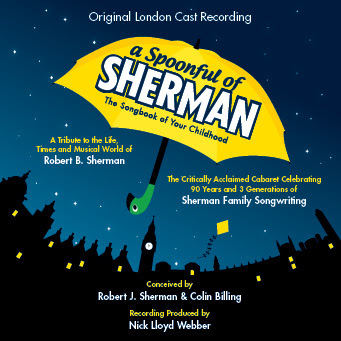 A gorgeous CD and not just for lovers of musical film and theatre, A Spoonful Of Sherman appeals to the child in us all.